Interviewing is a skill that anyone can master with the right training. 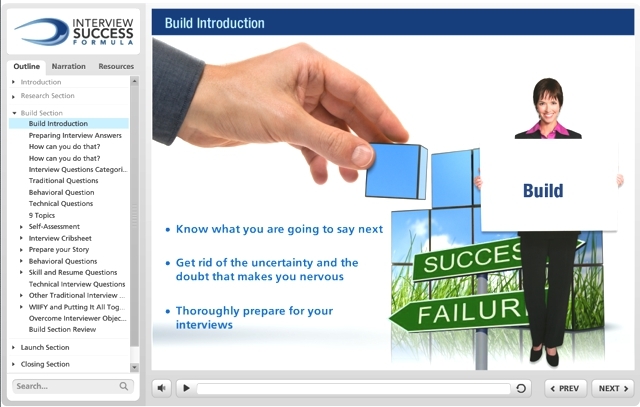 Our online interview course can provide you with that training. Here are some insights into how this course helps individuals like yourself hone these skills. 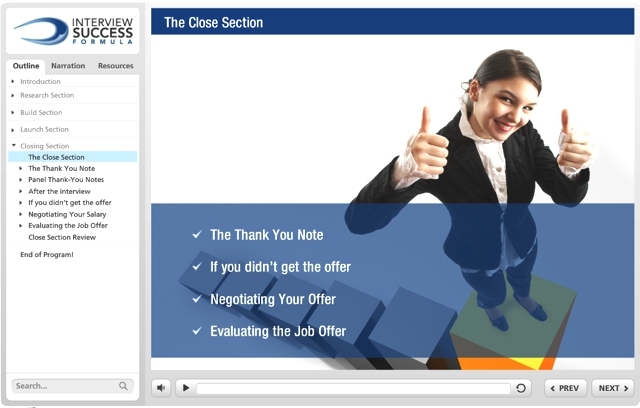 The online interview course will guide you through each of these four areas step-by-step. By ordering now, you get instant access to this system. Here is a little more detail about this process. To be effective in your next interview, you need to really know the hiring organization, understand exactly what kind of person they want to hire, and, if possible, know your interviewer. With the right knowledge, you can walk into the interview feeling comfortable about what the company does, what role you would play if you get the job, and how your background fits with the profile of the organization’s ideal hire. Our Research section helps you build your knowledge in these areas, using text guides, audio and video, as well as downloadable worksheets and checklists. When it comes to having memorable and effective answers, some people can wing it. The rest of us need to prepare ahead of time to produce strong results. Connection between what you can offer and what the employer needs. 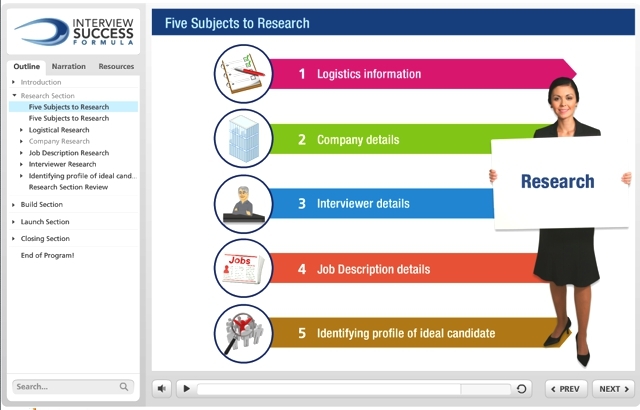 Our Build section helps you create strong answers to traditional interview questions, behavioral interview questions, and resume and skills questions. In addition to text guides, audio and video, worksheets and checklists, this section also includes sample answers to a variety of interview questions. As a complement to the build section, our Self-Assessment report helps you articulate your core motivations, values, strengths, and personality. We also include custom-built answers to 20 key interview questions based on these core attributes. Learn more about this unique aspect of our program here. Whether your interview is one-on-one, in a panel format, or via phone, you want to feel confident and communicate persuasively. You also want to avoid the common mistakes that cost people job offers. Our Launch section helps you become more confident and persuasive through your words and body language. It includes tips on what to do in the minutes before your interview, as well as effective questions you can ask in order to build rapport with the interviewer. Perhaps most importantly, this section provides tips on what not to do in an interview. Sometimes the difference between a job offer and a rejection is determined by the actions you take after your interview. Close, our Bonus section, helps guide you through the post-interview process, from sending a strong thank-you note to connecting with your references, to a variety of other actions you can take. Plus, when you do get the offer, this section can help you to negotiate your salary and decide whether or not you actually want to accept the job. The entire course is available online 24 hours per day, 7 days per week. And, we guarantee this program for a full 90 days. To get immediate access to the entire Interview Success Formula™ program, sign up here right now.